Five years ago, Cynthia Ward weighed 338 pounds. Her ankles, knees and hips were always hurting. 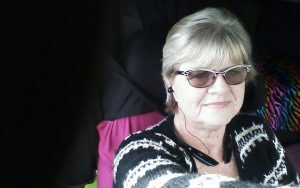 She failed her DOT physical and had 30 days to control her sugar levels. She had to make a change, fast. “I’ve lost a whole person since then,” Ward says. 160 pounds, to be exact. Ward’s story is an inspirational tale that other drivers can learn from. Every couple of weeks, Ward allowed herself a cookie or a sliver of chocolate cake as a reward to make the journey more enjoyable. Ward took several small steps toward success. She began by buying smaller dinner plates at Walmart. She started parking in the back of parking lots so she would have to walk farther. She also researched diets on the Internet and met with a dietitian, who helped her plan her portions. Now Ward rarely eats at truck stops. Instead, she keeps healthy eats in her truck at all times. She begins her day with a cup of coffee and a serving of Dannon Light & Fit yogurt, with only 9 grams of carbs. Even a small serving of yogurt, with flavors such as banana cream pie, strawberry cheesecake and toasted coconut, is enough to satisfy Ward’s sweets cravings. At noon, she indulges in raw nuts and indulges in lunch, her biggest meal of the day. Lunch is a serving of meat (the size of a deck of cards) and two cups of low-carb vegetables. Ward tops her day off with a light meal, such as chicken salad with dried fruit and walnuts. Ward designed her regimen on her own. The dietician she worked with initially wasn’t helping, Ward says. So Ward did her own research and came up with her own plan of consuming 1,200 calories and no more than 50 grams of carbs daily to keep her diabetes under control. To lose weight, Ward focused on diet, not on exercise. But she walks her dog every few hours, does squats during her pre-trip and often walks with an exaggerated march to burn more calories. Today, Ward weighs 180 pounds. Her goal is to lose 30 more pounds eventually, but she’ll continue to take it slowly. Ward focused on losing 25 pounds at a time. Do you have a great weight loss tip others can learn from, too? Connect with us here and tell us about it! 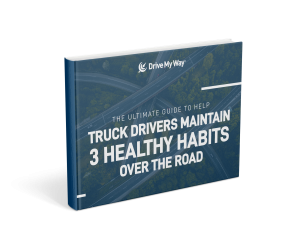 You may have heard it said “Watch and learn.” For truck driver Craig Grubb, barbecue is an entirely different matter—one where watching and learning is serious business. “I watch the Pitmasters shows on TV. That’s where I learned to blend my own spices,” says Grubb, who also scours recipes online routinely. If the truth be told, Grubb, a company driver for Smith Transport out of Roaring Springs, Pa., is a talented pitmaster in his own right. He makes his own barbecue sauces, experiments with sauces he finds at mom-and-pop shops and even created his own secret dry rub blend. In fact, the recipe is so secret, he won’t share it with anyone. Grubb loves hosting pig roasts for his friends in the summer. Grubb does however confess he often coats his meats with yellow mustard before adding a layer of his dry rub to them. The vinegar base in the mustard helps tenderize the meat, explains Grubb, who knows a thing or two about barbecue. And he should. After all, he’s barbecued for more than 20 years. An aficionado of smoking everything from pork ribs and brisket to game birds and pork shoulder, Grubb immerses himself in recipes and research and prides himself on his technique. “Everyone barbecued when I grew up, so I started doing it myself,” recalls Grubb, a CDL driver for 30 years, born into the business. “Barbecuing is a big hobby,” Grubb adds. At the Grubb household, big hobbies call for big gatherings. Whether it’s a full-on pig roast or not, Grubb fires up the smoker, invites friends and family over to share in the feast, and a party ensues. In addition, Grubb brings leftovers on the road with him. Grubb shares advice about smoking meats, too. To keep your meats from drying out, continually fill up your water pan, he says. Always smoke your meats “low and slow” at about 220 degrees. Have patience. Also, perhaps most importantly, “have friends willingly try what you cook,” Grubb advises. Also, Grubb recalls fondly the time last year he smoked two pork shoulders and built a big bonfire for friends and family in attendance. “If you come to one of my barbecues and you go away hungry, it’s your own fault,” he says. With Memorial Day right around the corner, we want to know what type of cooking gets you fired up, drivers. Connect with us here and share your specialty with us for a chance to be featured on Drive My Way. Heather Hogeland never aspired to be a truck driver. She grew up the middle of three girls, the tomboy of the bunch. 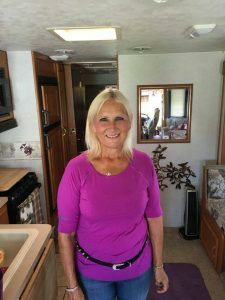 “In the ‘60s and ‘70s, girls didn’t dream about driving a truck,” she says.But her father, Robert, had an owner operator trucking job, so Hogeland was destined for the same career all along. It was her father who taught her how to drive a truck—and he taught her well. In 1976 at the tender age of 19, Hogeland got a CDL trucking job. 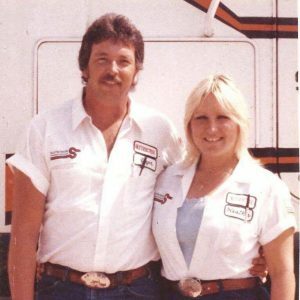 Hogeland and her husband, Roger, are retired team drivers who have been married for 33 years. In their heyday, they ran hard from south to north and everywhere in-between. By the early 1990s, Doreen came into an inheritance. She used it to make a down payment on a brand new Volvo truck. And despite her husband’s protests, in 1992, Doreen earned her CDL permit and started driving. Leased through Countrywide, a reefer carrier out of southern California, and later to Southern Star Transport, Doreen and Robert began running team together up to Toronto, Ontario. While Robert and Doreen rarely ran with their daughter and son-in-law, but it was a wild time when they ran together. Hogeland recalls the tales with a laugh. Doreen passed away in 2005 at age 69. Hogeland reminisces about her warmly even now, recalling her as a woman who never met a stranger. Who located stragglers at truck stops and invited them home for dinner. Who always put family first. To celebrate Mother’s Day we want to know if your trucking job brought you closer to a parent, too? Connect with us here and share your story. The spotted bags are sewn carefully over four hours and is one aspect of this trucker’s life. They’re made from cowhide that Zoe Marie Sutton buys on Etsy and EBay. Looking at them you would think they were manufactured at a high-end department store. In fact, Sutton stitched them at home on the weekends. That’s because Sutton, a professional cattle hauler and regional driver for Butler Trucking, gets home time most every weekend. When Sutton started sewing just one year ago, she found she had a natural gift for the pastime. Sutton has had a CDL trucking job since 1999. Given her familiarity with cattle, crafting items from cowhide seemed like a perfect fit for her. In the last year, Sutton has sewn aprons, potholders, pillowcases and dresses from all kinds of fabrics, but it’s her cowhide pouches that are most popular with her audience. Sutton contemplated what use she could have for pieces of cowhide she had purchased online. She decided to make pouches from them. Her idea was a hit. Sutton sells her merchandise through her Facebook page. Her cowhide pouches run between $55 and $100, depending on their size. Sutton prices her goods based on comparative items she sees online. “Piddling around” by now has flourished into a full-fledged talent for Sutton. What’s more, sewing allowed her to tap into her creative side, something she had not done in ages. Sutton enjoys losing herself in the quiet that sewing provides. She threads her needle, lets her thoughts wander and savors a respite from the daily grind. Truck drivers are full of surprising talents. So, what’s yours? 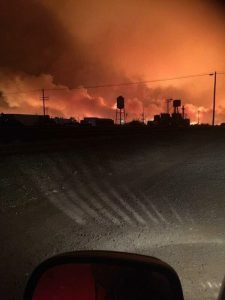 Fast-moving wildfires consumed the Midwest on March 6, sparking blazes in Texas, Oklahoma, Kansas and Colorado and inspiring a truckers rally. Winds gusted up to 60 miles per hour, ravaging livestock and wildlife, leaving charred remains everywhere in its wake. Thousands of animals burned to death, helpless against the flames. 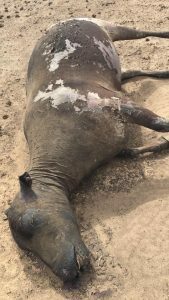 The horrific loss of livestock, property and yes, even human life, hit ranchers in these states hard. When truck drivers got word of the fires, they rallied in a huge way. Those who helped the cause walked away from it forever changed. Matt Schaller, a truck driver for Hunt Farms in Michigan, was among the drivers organizing the effort. He orchestrated the donation and transport of hay from Michigan to fire-ravaged towns. Schaller encountered a friend who wanted to send his truck to the Midwest, but he didn’t have any hay. So Schaller called a contact in the farming business and began seeking hay donations. Trucker Daisy Delaney, Schaller’s friend, got wind of the movement and volunteered to help, too. “I asked him, ‘You got room for another truck on there?’” Delaney recalls. Delaney, an owner operator leased to NRG Carriers, ran a load of hay from Ohio to Kansas. She even went a step further, using her social media account to acquire powdered milk for calves to drink. “I was talking to the guy I was going to pick up from in Ohio on the phone, he was telling me all these stories about how bad the fires were,” she explains. “I thought, ‘If they have this bad of fires, these baby calves are losing their mamas. We need milk replacer,’” Delaney says. So Delaney called Superior Farm Supply in Montpelier, Ohio, and asked if they had milk replacer. They did. Delaney took to Facebook to ask truckers to pre-purchase bags of it that she could add to her load when she picked up there the next day. Delaney picked up her load of hay and milk replacer in Montpelier, Ohio, and began driving it to Ashland, Kansas. En route, she got calls from people who’d heard about what she was doing, including a rancher who was taking ammunition donations. So she got on Facebook Live and started telling some of the stories she was hearing. Delaney has 900 Facebook followers, and her video began to spread quickly. Schaller, meanwhile, was deep in recovery efforts, too. After he had put the word out, momentum had built so fast that he had no choice but to tell his boss, Bill Hunt, what he had done. 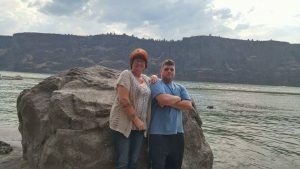 “He was on board 100 percent, and he donated the truck and the fuel,” says Schaller, who would take two trips to fire-ravaged areas. 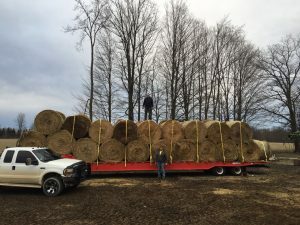 On that first trip, Schaller was part of a convoy delivering $15,000 worth of hay, milk replacer, calf starter feed and cattle medical supplies from Michigan to Oklahoma, a 1,200-mile journey. The convoy consisted of trucks from about 10 different companies, including MB Trucking, Corrigan Oil and Helena Chemical. Schaller and his crew also had set up a Go Fund Me page to help offset fuel costs. It was featured on the news. Soon, people began donating to it in droves. So Schaller’s convoy stopped in Miami, Okla., and bought $4,600 in hunting supplies and products for the 4-H kids caring for orphaned cattle. Once Delaney arrived in Ashland, Kansas, she stayed there for three days—unpaid—lending support and working to absorb the catastrophic damage she witnessed. Everything was scorched. Ranch owners Gina Kirk and David Noll took Delaney on a tour of their property, showing her what they had lost. Emilie Campbell gave Delaney a tour of Gardiner Ranch, or, what was left of it. Schaller’s convoy, moreover, arrived in Oklahoma at 3 p.m. on a Saturday. Consuming a full semi-load of round bales a week, the ranch only had a week’s worth of hay remaining when the convoy arrived. Sometimes trucking is so much more than just a job. What moving experiences have you had on the road? Connect with us here to share your story. Taavi Rutishauser has been a cyclist all his life. A driver and trainer for Quebec’s Canadian American Transportation (C.A.T. ), Rutishauser takes his bike everywhere he goes. He rides with a folding bike that fits neatly between his seat and his dashboard. In the winter, when his runs take him down to Laredo, Texas, he brings his mountain bike with him to ride with locals down there. Rutishauser rides his bike in his downtime, whether he’s waiting on a restart or unwinding from the workday. “I ride as often as I can,” he says. As a teen, Rutishauser raced mountain bikes. From age 20 to 25, he worked as a bike messenger in Montreal, leaving the job to pursue a career in trucking. Rutishauser has had a CDL trucking job for 16 years and has a million safe miles in the last 10 years. However, It didn’t take long for Rutishauser to gain weight after starting his CDL trucking job. After five years on the road, he was too soft around the middle for his own liking. In 2007, Rutishauser started cycling again. Over time, Rutishauser has shed 80 pounds from cycling. Today, he’s more reinvigorated by the sport than ever, often riding between 50 and 100 miles a week. In 2015, Rutishauser approached C.A.T. about launching a cycling program for the 100 truck drivers who work out of the company’s main terminal. Managers loved the idea and set about implementing it. Now the C.A.T. Health and Wellness Program, as it is called, allows C.A.T. truck drivers at the company’s main terminal to purchase folding bikes at Dumoulin Bicyclettes in Montreal at a discount. If a driver wants to finance the bike, C.A.T. finances up to $1,000 without interest. In addition, the company even pays for bike helmets for all drivers in the program. And the initiative has been a huge success. Of the 100 drivers in the main terminal, 10 percent have bought bikes through the program. Since he got back into cycling in 2007, Rutishauser has dropped from 260 pounds to 190 pounds. But there are other upsides to the pastime than weight loss. In addition, Rutishauser has seen a lot of the country through cycling. From country roads and farmers markets to rocky trails and residential streets, Rutishauser has enjoyed every turn. For exampke, some of his favorite spots include trails near Nashville, Tenn., and Danville, Va. Overall, sometimes you have to express yourself and see where it takes you. 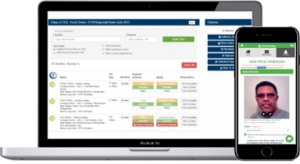 What other programs have you had a hand in creating at your employer, drivers? Join our community here and tell us about it. It was mid-afternoon last September when Sadie went missing. Joshua Gray opened the door of his truck at a Love’s truck stop in California. That’s all it took. Sadie bolted from the truck like lightning. Joshua and his wife Chana, team drivers for Forward Air, searched for their beloved terrier mix for three hours. They called animal shelters and posted on Facebook. It was useless. Sadie was gone. The Grays were heartbroken, and the next few days were filled with tears and angst as they wondered where Sadie was and if they would ever be reunited with her. “I thought for sure I would never see her again,” Chana says. The Grays are members of the Facebook group Trucking Fur Babies, dedicated to truck drivers who ride with pets. Chana posted in Trucking Fur Babies about Sadie, never thinking it would actually lead anywhere. Three days after Sadie went missing, the most remarkable thing happened. Chana received a message from driver Tammy Edmonds, another member of Trucking Fur Babies. She had spotted Sadie just a short distance from where she went missing. 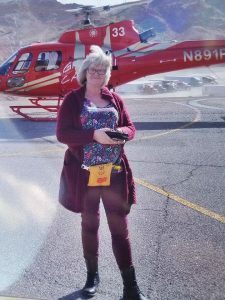 “Tammy spotted her and followed her to a guy called Chevron Larry, a homeless man in Coachella, California,” Chana recalls. Chana spoke with Chevron Larry over the phone. He agreed to care for Sadie until the Grays could be rerouted back to California. 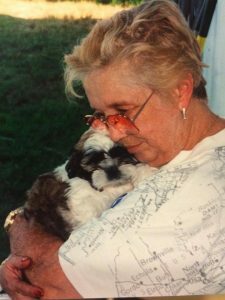 Within days they were reunited with their beloved Sadie. By the time the Grays arrived in Coachella to pick up Sadie, Chevron Larry had developed affection for her. In the short time he had Sadie, he fed her hot dogs and took her everywhere he went. “He told me, ‘Just take care of her,’” recalls Chana, who gave Larry some cash and fresh bedding as thanks for his help. Do you have a great pet story of your own? Join our community here and tell us about it! Trucker Matt Blattel Built a House. Now He’s Building His Career. Matt Blattel loves the outdoors. Hunting, fishing, camping, he loves it all. In fact, Blattel’s love of the outdoors goes back to his childhood on a 3,000-acre farm in southeast Missouri. His family raised 1,000 hogs and 1,000 cattle. “That’s where I began to learn about building,” says Blattel, a regional driver for Baldwin Express who was matched to his job through Drive My Way and absolutely loves what he’s doing. In addition, Blattel said that Baldwin Express takes care of him, so he finally is able to enjoy the work-life balance he sought for so long. The house Matt Blattel built. He also made the name plate in front and designed the landscaping. Blattel has had a CDL driver job for 21 years. But, when he’s not trucking, he’s a talented builder. Blattel, now 46, figures he’s been building things for 30 years. He carves decorative logs for his friends at the holidays. But he’s proudest of his masterpiece: his mother-in-law’s house. Blattel built the house from the ground up eight years ago, saving his mother-in-law $40,000 in the process. It took Blattel a mere seven months to build the house in his spare time. Now his wife wants him to construct a new house for them. “Whatever she wants,” he says. And he means it. Blattel picked up his talent for building just by growing up around it. He learned by paying attention. In summary, it all takes patience, organization and most of all, a clear vision. In addition, the same goes for his job at Baldwin Express. “I couldn’t be happier,” he says. He was called by the sea. For four years, Brian Matthews worked on a tugboat and traveled to ports around the world as an able seaman and merchant mariner. The job instilled in him a lifelong yearning for the ocean—and a talent for 3-D drawing and woodworking. A lifelong artist, Matthews often drew on the boat. His engineer saw his drawing one day and asked him if he would carve a model of it. Matthews never had carved anything before, so he rose to the challenge. Carving is a talent Matthews nurtures to this day, and his truck has become his workshop on wheels. Matthews made the transition from able seaman to CDL trucker 16 years ago. “I always wanted my own truck,” he reasons. Now Matthews works as an over the road flatbedder for E.W. Wylie, carving whenever time allows—whether he’s waiting on a load or breaking for his 34-hour restart. Scraps of wood often pile up in his truck, evidence of Matthews’ talent at work. Matthews always draws 3-D renderings of his models before carving them, measuring as he draws for accuracy. His models typically measure 6 feet long and 9-and-a-half inches wide. The best thing Matthews ever carved was stolen years ago from his Houston apartment during a break-in. It still pains him. It was a replica of the last tugboat Matthews ever worked on, the Jackie B., and it was one of only two replicas Matthews ever made. The other was of the famous New Orleans steamboat, The Natchez. So the young Matthews took up drawing. He’s been drawing ever since. Matthews likes to create lighting for his models, too. Despite his artistic chops and his love for his CDL trucking job at E.W. Wylie, Matthews always will be a mariner at heart. What drives you every day, truckers? Connect with us here to share you story.